Three Jupiters, Part 2: A Jupiter analogue orbits another star. This is a little unfair. We don’t know for sure if it’s an evil twin. Photo illustration by Phil Plait. Photos by NASA, ESA, and A. Simon (Goddard Space Flight Center)/Shutterstock & Tribalium. Three recent news stories have come out, all dealing with exoplanets—alien worlds—that have something in common with Jupiter. All three stories are pretty cool, and I thought it would be fun to tell each in a separate, but related post. Part 1 went up Tuesday. For added fun, I can tie the planet to the post number, too: For Part 2, it’s a planet that’s a double of our own big brother. In the world* of exoplanet hunting, one of the big goals is to find an Earth analogue: A planet the same mass and size of Earth, and which also receives about the same amount of light/heat from its parent star as we do. The reasoning for that is obvious enough, and we’ve found a couple that seem to be pretty close. But that’s not the only goal. Another one would be to find other planets orbiting other stars that look much like our other planets. One reason for this is that we still don’t have a firm understanding of how our solar system evolved after it formed. Gravitational interactions between the planets would have changed their orbital positions, and it’s possible, even likely, they migrated a lot in their early years. Plus, we just want to have more examples of planets like our own to put our solar system into context. Are systems like ours common, or rare? Do most have a few smaller and a few bigger planets, or do other systems have different distributions? Over the years we’ve found some planets that are similar in mass to Jupiter, for example, but they orbit their stars very close in. We call these “hot Jupiters,” and they appear to be pretty common in the galaxy. But what about planets like our Jupiter: The same size and mass, and also get about the same amount of light from their star? A few have been found, but a new one that might fit the bill is particularly exciting: It was found via the transit method. I’ll need to explain a bit, but first, about the planet: Called Kepler-167e, it orbits the star Kepler-167, which is more than 1,000 light-years from Earth. The star is slightly less massive and cooler than the Sun, but the planet is closer in, so it receives about the same amount of heat from its star as Jupiter does from the Sun. It may have very close to the same temperature as Jupiter. In this case, the important bit is that its diameter has been found, and it’s 130,000 kilometers across—compare that with Jupiter, which has a width of about 140,000 kilometers. Not bad. You can also read more about it at AstroBites, a wonderful technical blog about current astronomy news written by graduate students. So let me get back to the planet’s mass. Here’s the problem: We can’t find it for this planet, and it’s only weakly constrained by the data. It might be as low as 0.3 times Jupiter’s mass … but it could also be as much as 50 times Jupiter’s as well. Why is that? I need to backtrack a bit. The planet was found using data from the Kepler spacecraft. Kepler stared at about 150,000 stars, looking for a dip in starlight that could be caused by a planet orbiting the star and blocking a bit of the star’s light. These transits tell you a lot about the planet: First, that it exists at all, but also its size (determined by how much starlight it blocks) and its orbital period (by how long it takes to cross the star). In this case, Kepler-167e blocks about 1.6 percent of its star’s light, which is how the planet’s size was found. Two transits were seen—the minimum needed to confirm its orbit—and the period determined to be 1,071 days, or just under three years (had it been much longer, Kepler might not have actually seen more than one transit, so it’s nice this planet was found at all). The “light curve” when Kepler-167e blocked the light from its star. That’s a very clean plot! The problem is the transit method can’t tell you the planet’s mass. That can be found by taking exacting and high-resolution spectra of the star. As the planet orbits, it tugs on the star, and the star’s light red and blue shifts (if you want more info, I’ve written about this before). That has not been done for this star, and would be difficult: The three-year orbital period of the planet means observations would have to be taken over a very long period of time. For planets like Earth, which are solid, we can make a decent if rough guess about the mass given the size. 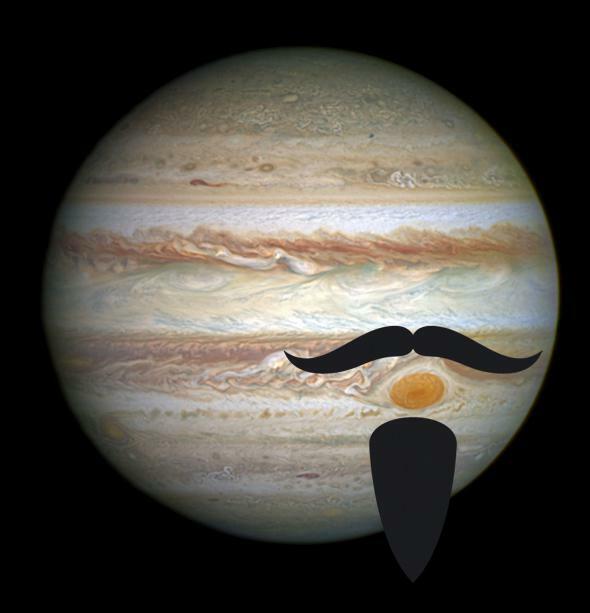 But planets around Jupiter’s size are weird: If you start adding more mass to them, their size doesn’t change. They just get denser. So a planet with ten times Jupiter’s mass, even 50 times, won’t be that much different in diameter than Jupiter. That’s why the mass of this planet is so poorly known. That’s too bad: A true Jupiter analogue would have about the same mass, and we just don’t know for this planet. In fact, if it’s more than about 10–13 times Jupiter’s mass, we wouldn’t even call it a planet; we’d say it’s a brown dwarf. Still, it’s pretty cool. Even cooler, there are four other planets in the system, each orbiting much closer in and only somewhat bigger than Earth (specifically 1.6, 1.5, and 1.2 times wider). They all orbit so close to the star that they’re very hot; their temperatures are all well above the boiling point of water. So even if Kepler-167e turns out to be very close to Jupiter in size, mass, and temperature, its home system is plenty different than ours. But that’s OK; now we have a data point on how a planet like that affects a system different than ours, and we still learn something. More data is always good, even if it’s different and not what we expect. Heck, especially so. The next question is, how common are these Jupiter doubles? The astronomers who found this one posit there may be 10 or so in the Kepler data. They won’t be easy to find, but hopefully given time and effort they’ll turn up.